It's Nexus time! The freshest and the most powerful handset from Google is here! The Huawei-made Nexus 6P. The Google Nexus 6P becomes official as the search company's top of the line handset which caters the phablet-loving users. On paper, this device is the first-ever Nexus smartphone to use an all-metal unibody fashion - joining the rest of the 2015 flagship smartphones in the market. Despite having a "6P" moniker, the handset only features a 5.7-inch Quad AMOLED display. The Nexus 6P is fresh; in fact it’s made by Nexus first-timer, Huawei. Design-wise, the Chinese outfit had a greater influence on the phablet than Google. The candybar phone is basically thin with 7.3 millimeter on its thickest point. The handset is taller compared to the previous Nexus 6 due to the inclusion of dual frontal speakers. Talking about the internals, the smartphone employs the newer and enhanced version of the Snapdragon 810 (which is now cooler than the first S810 generation). Camera-wise, the Nexus 6P is also a performer. This powerhouse boasts a 12.3MP sensor with 1.55-micrometer pixels and F/2.0 aperture. The rear camera can record up to 2160p videos and capture great low-light quality with the addition of the dual-LED flash. For selfie lovers, the front-facing camera includes an 8MP sensor with 1.4-micrometer pixels and F/2.4 aperture. As expected, the Google Nexus 6P becomes one of the hardware ambassadors of Android 6.0 Marshmallow which is the freshest and the fastest mobile operating system from the Alphabet-owned company. The handset also enjoys the Doze function embedded in the OS which will optimize the usage of the 3450 mAh battery. 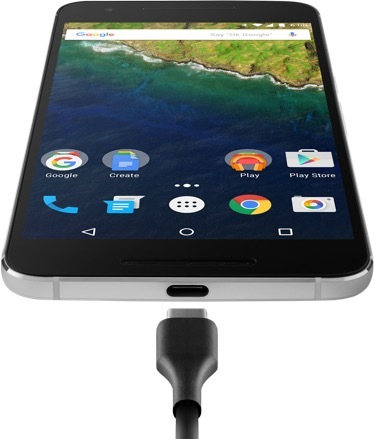 Likewise, the Nexus 6P joins the bandwagon of reversible USB Type C users which also improves charging capability of the smartphone. According to Google, a 10-minute charging time will allow 7 hours of phone usage. The RAM is still stuck at 3GB but the addition of the Nexus Imprint fingerprint sensor at the back panel makes it more interesting than ever. You can also choose among 32GB, 64GB and 128GB configurations. The 32GB comes with an asking price of USD 500. The 64GB and 128GB are priced at USD 550 and USD 650, respectively. The Google Nexus 6P is painted with Aluminum, Graphite, Frost and Gold colors.